In this post I will show how to convert the raw values read from an accelerometer to 'Gs'. The code for this guide can be found under the python-BerryIMU-measure-G directory. For example, an accelerometer at resting on a table would measure 1G ( 9.81 m/s2) straight upwards. By contrast, accelerometers in free fall and accelerating due to the gravity of Earth will measure zero. The accelerometer used by the BerryIMU is a MEMS sensors(LSM9DS0), which outputs the raw readings as mg/LSB. Most MEMS accelerometers use this output format. 1mG = 0.001 G's of acceleration, so 1000mG = 1G. LSB = Least Significant bit, which is the last bit on the right. The LSM9DS0 outputs a 16 bit value for the accelerometer readings. The raw values from the accelerometer are multiplied by the sensitive level to get the value in G.
Let's use FS ±2 g as an example sensitivity level. As the range is -2 to +2, this would be a total of 4g. Or 4,000 Milli-Gs. Each time the LSB changes by one, the value changes by 0.061, which is the value highlighted in blue in the table above. For FS ±8 g, the range would be -8 to +8, which is a total of 16,000 MilliGs. The above values of 16,17 and 18 above a very low and only used for illustration. If your accelerometer is horizontal and resting and at rest when using a sensitive level of ±2g, the raw value for Z should hover around 16,500. If you accelerometer is horizontal and at rest, when using a sensitive level of ±8g, the raw value for Z should hover around 4,475. The first line above is used to initialise the accelerometer with a sensitivity level of ±2g. The second line prints the calculated value as G using the raw values from the accelerometer. The second line prints the calculated value as G uses using raw values from the accelerometer. What filter would be appropriate for the accelerometer data? It doesn't drift much, and at most is slightly offset(from mounting) which can easy be corrected with calibration. But the signal is quite noisy. I was thinking of using a low pass filter or a median filter. Are there more suitable alternatives or a worked example? Both filters would work and would do a good job. Note that both would add a delay, which is in most cases negligible. I have code for two of them below. It is being used for compass, but you can just change it to the accelerometer values. Thank you very much for your guide. It has provided me a lot of help. 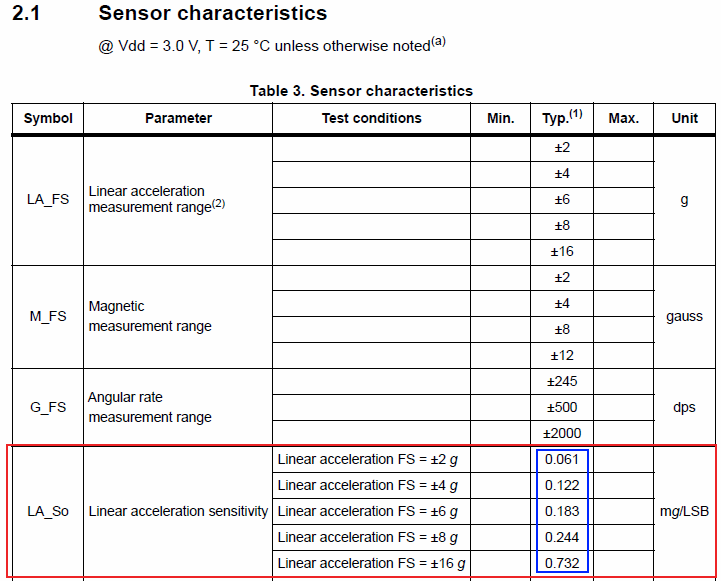 For ±16 g, 32,000 MilliGs / 65,535 = 0.488, which is not same as the linear acceleration sensitivity (0.732) in the datasheet. In this case, which one should we use? The one obtained through calculation or the sensitivity in datasheet? In fact, I had found something similar in your guide in interfacing gyroscope and accelerometer. In that case, you are using sensitivity. you have ±16 g = 32,000 MilliG. I should be ±16 g = 16,000 MilliG. How come for ±16 g, it's 16,000 MilliG, when for ±8 g, it's 16,000 MilliG...? I have to look into to why 0.732 is used for ±16 g.
Did you ever discover why 0.732 is used? I spoke to ST who make the LSM9DS1, they told me that not all 16 bits are used for ±16 G.
I asked how many are used and they told me they couldn't give me this information as it is proprietary. Another way to explain the 0.732 is that the widest range is not ±16 g, but ±24 g !!! May I ask the fastest frequency of getting the data, I found the sample code can provide data around 100Hz sampling rate, may I increase it to 1000Hz? This is documented on page 55 and 56 of the datasheet. In the example code (python-berryIMU-measure-G) the value .224 is used for the 8G scale. This value should be .244 per the table included in this article. Couldn't figure out why I wasn't reading 1G at level with no motion so double-checked code. hi, Will u plz help me how to convert X,Y,Z axis raw data of LIS3DH to acceleration and how to detect sudden acceleration and harsh breaking (deacceleration) in car. Why are you using "G" and "g" in the beginning? Are they not the same? you need to shift to get the 16 bit value from two 8 bit values. X_axis = (int16_t)(X_Low | X_High < < 8); 6,612 axis = (int16_t)(212 | 25 << 8); or in binary 00011001 11010100 = (11010100 | 00011001 <<8 ) You will see that 00011001 is now the first part of the 16 bit value and 11010100 is the second half of the 16 bit value. Are these values close to the average, or is my x-values completly wrong? if the IMU is flat.. you should only be getting large values on Z. you may get some small values on X and Y, this would be because the IMU isn't absolutely horizontal. Your X vales look incorrect. Are you using unmodified code from the git repo? Thank you sir, your work and time spent on this guide and the IMU/gps boards is appreciated. I have learned a lot. There is enough information here to get started, that is extremely valuable to using something! Seems like people always forget that... anyway, thanks! Why divide ACCz * 0.061 by 1000 ? ?